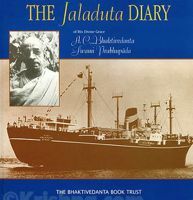 Several years after Srila Prabhupada first arrived in America, a disciple discovered the diary he had kept during his passage from India on the steamship Jaladuta. Inside was a poem, handwritten in Bengali, that Srila Prabhupada had written on board the ship just after it had arrived in Boston harbor. The poem beautifully captures Srila Prabhupada's first impressions of Western civilization and reveals his heartfelt determination to change the consciousness of America. Most of the population here is covered by the material modes of ignorance and passion. Absorbed in material life, they think themselves very happy and satisfied, and therefore they have no taste for the transcendental message of Vasudeva. I do not know how they will be able to understand it. But I know Your causeless mercy can make everything possible, because You are the most expert mystic. All living entities have become under the control of the illusory energy by Your will, and therefore, if You like, by Your will they can also be released from the clutches of illusion. I wish that You may deliver them. Therefore if You so desire their deliverance, then only will they be able to understand Your message. The words of the Srimad-Bhagavatam are Your incarnation, and if a sober person repeatedly receives them with submissive aural reception, then he will be able to understand Your message. It is said in the Srimad-Bhagavatam (1.2.17-21): "Sri Krishna, the Personality of Godhead, who is the Paramatma [Supersoul] in everyone's heart and the benefactor of the truthful devotee, cleanses desire for material enjoyment from the heart of the devotee who relishes His messages, which are in themselves virtuous when properly heard and chanted. By regularly hearing the Bhagavatam and rendering service unto the pure devotee, all that is troublesome to the heart is practically destroyed, and loving service unto the glorious Lord, who is praised with transcendental songs, is established as an irrevocable fact. At the time loving service is established in the heart, the modes of passion [rajas] and ignorance [tamas], and lust and desire [kama] disappear from the heart. Then the devotee is established in goodness and he becomes happy. Thus established in the mode of goodness, the man rejuvenated by loving service to the Lord gains liberation from material association [mukti] and comes to know scientifically of the Personality of Godhead. Thus the knots of the heart and all misgivings are cut to pieces. The chain of fruitive actions [karma] is terminated when one sees the self as master." He will become liberated from the influence of the modes of ignorance and passion and thus all inauspicious things accumulated in the core of the heart will disappear. Somehow or other, O Lord, You have brought me here to speak about You. Now, my Lord, it is up to You to make me a success or failure as You like. O spiritual master of all the worlds! I can simply repeat Your message, so if You like You can make my power of speaking suitable for their understanding. Only by Your causeless mercy will my words become pure. I am sure that when this transcendental message penetrates their hearts they will certainly feel engladdened and thus become liberated from all unhappy conditions of life. O Lord, I am just like a puppet in Your hands. So if You have brought me here to dance, then make me dance, make me dance. O Lord, make me dance as You like.